What will it take for Congress to finally act? Probably not another shooting, even in its backyard. 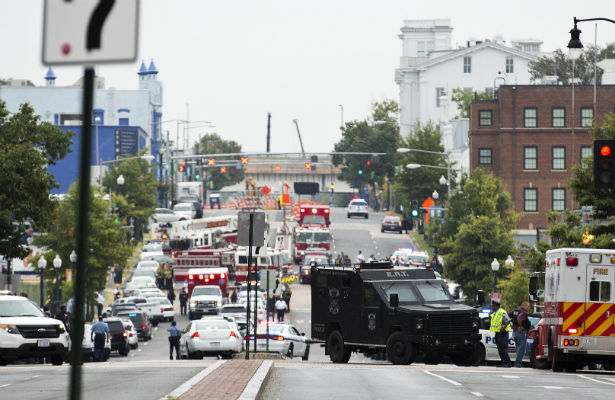 At least thirteen people were killed at the Washington Navy Yard on Monday, including a suspected gunman, in the latest iteration of a now-familiar US news event: a mass shooting that claims victims apparently at random. As the streets of DC came to life Monday morning, reports emerged around 8:20 am that shots were fired at the naval facility on the city’s southeast waterfront, less than two miles from the US Capitol. It quickly became clear that multiple people had been shot during a rampage, and at a 2 pm news conference on the perimeter of the crime scene, police confirmed that twelve people lay dead inside. The number was later updated to thirteen. During a press briefing at the MedStar Washington Hospital Center not long after the shootings, a spokeswoman speculated that “it had to be a semi-automatic [weapon],” based on witness descriptions of gunshots heard in “rapid succession.” Authorities later confirmed that indeed the suspected gunman had an assault rifle as well as a pistol. Police identified the deceased suspected shooter as Aaron Alexis, a 34-year-old man from Fort Worth, Texas, who reportedly worked at some point as a contractor for the Navy. In the context of increasingly frequent mass shootings and a highly visible congressional debate on gun control, any further mass gun violence is sure to become a political issue—all the more so when it happens in Washington itself. Had the scene outside the Navy Yard been in a movie about a fictional gun control debate, it probably would have been rejected as too didactic. The Capitol dome was part of the nearby skyline as reporters, television cameras, scattered passerby and law enforcement officers converged on M Street Southeast at the western edge of the perimeter set up by police. To the east, all one could see was a small army of emergency responders in the street; the sidewalk-to-sidewalk flashing lights made individual vehicles almost indistinguishable. A US Park Police helicopter flew in tight circles extremely low overhead. In isolation it was not that unusual of a sight in DC: it looked like perhaps one of the many motorcades that criss-cross the city from time to time. But people on the street were unusually quiet and unsettled, because of course there was no dark limousine nor group of dignitaries in the middle of the chaos but rather the scene of a grisly multiple murder. Many of the reporters at the scene wore congressional press credentials and might have otherwise been covering a comparatively dry budget debate, but instead scoured around for witnesses to the shooting. Blocks away, Senate office buildings were placed on a two-hour lockdown, with staffers unable to exit or enter, and intimidating military-style vehicles surrounded the Capitol complex. In that fictional movie, this is where a dysfunctional Congress finally springs into action and helps solve the problem. The very same staffers who worked behind the scenes to scuttle this year’s big gun control legislation, now trapped in their offices because a mass shooter might be on the loose, suddenly see the light and pull the Manchin-Toomey legislation out of their desk drawers. But will that happen here? While it’s clearly very early on, and the gun control debate has taken some surprising turns in the past year, this scenario seems unlikely. Senator Manchin already told reporters Monday afternoon he still didn’t have the votes to get his gun control legislation passed; no previously opposed members suddenly announced a new position. Only hours before the shootings, members of Congress and gun control advocates were bemoaning a recent loss of momentum in Congress thanks to recall elections in Colorado that cost two longtime legislators their jobs because they supported tighter gun rules earlier this year. Continued inaction seems likely because the gun control debate has never suffered for an absence of bloodshed. Manchin-Toomey didn’t fail because the slayings at Sandy Hook Elementary School weren’t quite tragic enough. More indiscriminate killings—even right in the backyard of Congress—probably won’t change the fundamental calculus made by Senators to sidestep the wrath of the National Rifle Association (on display in Colorado just last week) and extremely pro-gun conservative voters, who value “gun rights” to the exclusion of almost any other issue. That said, the gun control package was only a couple of votes short in the Senate this year. Maybe more shootings will finally convince someone to change his or her vote. But more likely, until the fundamentals of the debate change, this mass bloodshed will only serve as gruesome illustrations of a problem nobody in Washington can seem to solve—nor even meangingfully address.